The President, Shri Pranab Mukherjee lighting the lamp to inaugurate the cultural festival 'Songs and Dance of the North East', in New Delhi on April 11, 2015. The Minister of State for Development of North Eastern Region (I/C), Prime Minister’s Office, Personnel, Public Grievances & Pensions, Department of Atomic Energy, Department of Space, Dr. Jitendra Singh, the Chief Minister of Meghalaya, Dr. Mukul Sangma and other dignitaries are also seen. The President of India, Shri Pranab Mukherjee has inaugurated the first ever event titled ‘Songs & Dances of Northeast’ organized by North-Eastern Council (NEC) and Ministry of Development of North-Eastern Region (DoNER), here today. The Union Minister of State (Independent Charge) of the Ministry of Development of North-Eastern Region (DoNER), MoS PMO, Personnel, Public Grievances, Pensions, Atomic Energy and Space, Dr. Jitendra Singh, the Chief Minister of Meghalaya, Dr. Mukul Sangma and other Governors and Chief Ministers of the eight North-Eastern States were present on the occasion. This event will be held by rotation in different parts of the country in collaboration with one of the eight States of the region. Speaking on the occasion, the President said the states of North East are an important part of the country. Despite their small population, they have made immense contribution to the nation. The people of the region took active part in the freedom struggle. Many of their political personalities have enriched national life. Song, dance and music are part of the everyday life of the people of the region, who are known for their hospitality and courtesy. The region has rare flora and fauna, natural scenic beauty and rich cultural heritage. The festival showcasing the rich, cultural ethnicity and diversity of North East India will help bridge the gap between the people of the North-Eastern States and the rest of India. 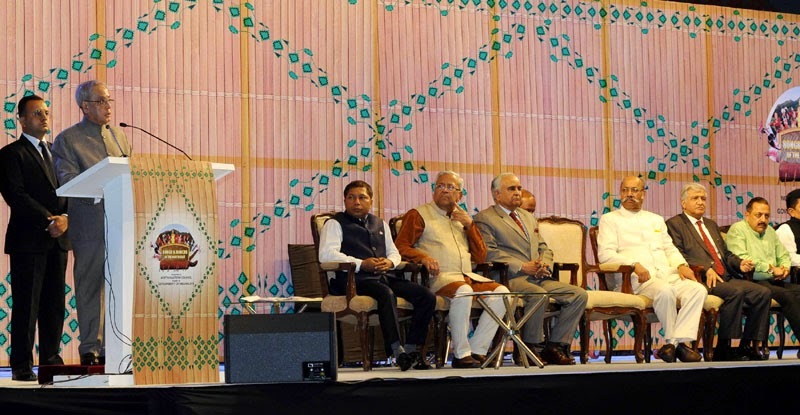 The President, Shri Pranab Mukherjee addressing at the inauguration of the cultural festival 'Songs and Dance of the North East', in New Delhi on April 11, 2015. The Minister of State for Development of North Eastern Region (I/C), Prime Minister’s Office, Personnel, Public Grievances & Pensions, Department of Atomic Energy, Department of Space, Dr. Jitendra Singh, the Chief Minister of Meghalaya, Dr. Mukul Sangma and other dignitaries are also seen. The President said the economic development taking place in the region will benefit not only the people of the area but also the entire country. Locational advantage and rich resource endowment of the North East makes it an ideal hub for dealing with India’s eastern neighbours. The region has a critical role to play in the implementation of the Government’s Act East Policy which seeks to build closer bonds with the ten countries of ASEAN who are amongst the fastest growing countries of the world. Dr. Jitendra Singh, while speaking on the occasion, said this is just a beginning and more such events will follow in the months to come in other parts of the country as well. He said, an event like this is not a substitute, but in fact, a supplement to all the activities that the DoNER Ministry has started on fast-track in the North-Eastern region during the last four months. The purpose of holding events like this is to showcase the various facets of Northeast to people living outside Northeast, he added. By involving one of the eight States by rotation in each of these events, Dr Jitendra Singh said, another purpose that will be served is that of sense of participation by the State government even though the entire funding and budget will be borne by NEC. 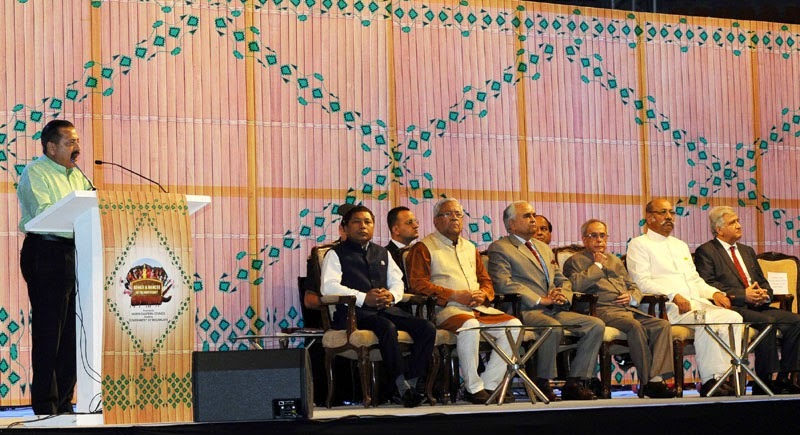 The President, Shri Pranab Mukherjee witnessing the cultural program, at the inauguration of the cultural festival 'Songs and Dance of the North East', in New Delhi on April 11, 2015. The Minister of State for Development of North Eastern Region (I/C), Prime Minister’s Office, Personnel, Public Grievances & Pensions, Department of Atomic Energy, Department of Space, Dr. Jitendra Singh and other dignitaries are also seen. The theme of future events in this series, Dr. Jitendra Singh said, will be determined on the basis of the characteristics of whichever State is hosting the event and the city in which it is being held. This initiative will also help in convincing potential investors and visitors, including producers from film industry, at a much cost effective budget in the North Eastern region. Speaking on the occasion, the Chief Minister of Meghalaya, Dr. Mukul Sangma said that he was very delighted at the initiative of NEC and appreciated the efforts of DoNER Minister Dr. Jitendra Singh. He said, he had personally persuaded all the artists and also the people living in the Union Capital to come forward and participate in this event. He requested the President to personally bless such events in future also. By showcasing the culture and assets of Meghalaya before the rest of the country through an event like the one held today, Dr. Sangma said, it would be possible to bring mainstream India closer to Meghalaya and also elicit support and patronage from rest of India for the development of Meghalaya. The Minister of State for Development of North Eastern Region (I/C), Prime Minister’s Office, Personnel, Public Grievances & Pensions, Department of Atomic Energy, Department of Space, Dr. Jitendra Singh addressing at the inauguration of the cultural festival 'Songs and Dance of the North East', in New Delhi on April 11, 2015. The President, Shri Pranab Mukherjee, the Chief Minister of Meghalaya, Dr. Mukul Sangma and other dignitaries are also seen. 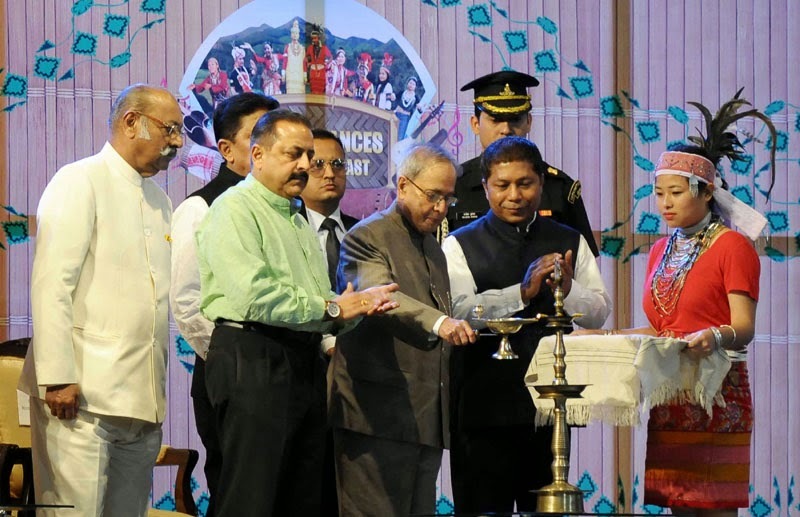 The President of India, Shri Pranab Mukherjee inaugurated a cultural festival “Songs and Dances of the North East” organized by Government of Meghalaya and sponsored by the North Eastern Council in New Delhi today (April 11, 2015). In order to alleviate the distress of the farmers following the vagaries of nature, increased financial assistance has been provided to the small and marginal farmers engaged in animal husbandry and for desilting of agricultural land under the initiatives announced by the the Prime Minister to provide relief to farmers . Now for the replacement of milch animals, the assistance has been increased from Rs 16400 to Rs 30000 for buffalo/cow/camel/yak etc.In case of replacement of sheep/goat, the financial assistance has been raised from Rs 1650 to Rs 3000. Similarly in case of replacement of draught animals,for camel/horse/bullock etc ,the quantum of financial assistance will be now Rs 25000 instead of Rs 15000 to.For the replacement of calf/donkey/pony/mule, the financial assistance has been raised from Rs 10000 to Rs 16000. The assistance for land and other losses due to silting of agricultural land has been increased from Rs 8100 per hectare to Rs 12200 per hectare. It will also be applicable to removal of debris of agricultural land in hilly areas and restoration or repair of fish farms. In case of loss of substantial portion of land due to land slide, avalanche, change of course of rivers, the existing level of financial assistance has been hiked from Rs 25000 per hectare to Rs 37500 per hectare for small and marginal farmers. The Prime Minister has already announced that the farmers will now be eligible for input subsidy if 33 percent or more of their crop is damaged. Earlier, they used to get input subsidy only when the crop damage was 50 percent or more. The Prime Minister has also announced enhancement of the existing quantum of financial assistance by 50% in case of crop losses. These compensatory measures have been carried out after revising the norms under National Disaster Response Fund/ State Disaster Response Fund which will be effective from 1st April 2015. However, a special dispensation has been made for the farmers affected by hailstorms in different parts of the country during February/March 2015 and they will be given assistance under the new norms. The enhanced input subsidy norms have been announced for various other categories also.In case of agriculture crops, horticulture crops and annual plantation crops, the input subsidy has been hiked from Rs 4500 per hectare to Rs 6800 per hectare in rainfed areas and restricted to sown areas. In the assured irrigated areas, it has been hiked from Rs 9000 per hectare to Rs 13500 per hectare. In case of perennial crops, the quantum of input subsidy has been hiked from Rs 12000 to Rs 18000 per hectare. For those, engaged in sericulture, the input subsidy has been hiked from Rs 3200 - Rs 4000 per hectare to Rs 4800 – Rs 6000 per hectare. Now the norms of NDRF/SDRF will automatically be reviewed during April each year based on annual inflation derived from Wholesale Price Index and would be rounded off to next multiple of 100. Meanwhile, the Agriculture Ministry has directed states to disburse relief from State Disaster Response Fund without any delay and in case of shortfall, they should use their State Contingency Funds as well as submit their memoranda to avail assistance from National Disaster Response Fund. Agriculture Ministry has also directed the State Governments to ensure faster processing of claims under the agriculture insurance schemes. In view of damage to onion and potato crops, the Agriculture Minister Shri Radha Mohan Singh has written to all states including Uttar Pradesh, Maharashtra and West Bengal where there is likelihood of increase in their prices, to purchase and maintain stocks of the same under Market Intervention Scheme. The National Legal Services Authority (NALSA) held Lok Adalats across the country mostly on Labour and Family matters wherein about 2,40,000 cases were settled today out of the courts. The total value of settlement reached in these Lok Adalats is over Rs. 40 crores. Of the cases settled, about 9625 are pending matters and 2,26,017 are pre-litigation matters. In addition over 44,000 other cases, such as, NI Act, LAC, Revenue, Civil Suits etc. were also amicably settled for a total value of over Rs. 42 Crores Out of these, about 36129 were pending in various courts and 8202 were pre-litigation matters. A Bench of Hon'ble Mr. Justice Abhay Manohar Sapre, Judge, Supreme Court of India and Hon'ble Mr. Justice Amitava Roy, Judge, Supreme Court of India was constituted where 13 pending cases were also taken up for amicable settlement. National Lok Adalats are now being held on every second Saturday for the past few months on specific subject matters in accordance with a Calendar drawn for the purpose under the directions of the Hon’ble Mr. Justice T.S.Thakur, Judge, Supreme Court of India & Executive Chairman, NALSA and Hon’ble Mr. Justice H.L.Dattu, Chief Justice of India & Patron-in-Chief, NALSA. Cases at pre-litigation stage and those pending in courts are being taken up for settlement in these National Lok Adalats. The aim is to reduce pendency, by resolving issues wherever settlements are possible to prevent additional litigation swathing the courts. Through the National Lok Adalats, the attention of the public has been drawn to the efficacious Alternative Dispute Resolution method of Lok Adalat. There will be no further appeal in those matters settled. Thus, it will have a significant impact on the overall judicial system. On the other hand, the settlement at pre-litigation stage would mean that, that many cases will never reach the courts. Minister of State in the Ministry of Personnel, Public Grievances and Pensions, and Prime Minister’s Office Dr. Jitendra Singh inaugurated the 1st National Symposium on Excellence in Training (NSET) here today. In his inaugural address Dr Jitendra Singh, complimented DOPT for organizing 1st Symposium on Excellence in Training while emphasizing that learning is a lifelong process. He mentioned that the Symposium will provide a national level platform to stakeholders to interact with national and international experts and know about global best practices in training. Dr Singh reiterated the vision of the Hon’ble Prime Minister by highlighting the importance of Good Governance, Citizen Centricity and focus on effective Public Service Delivery. Speaking on the occasion Shri Sanjay Kothari, Secretary, Department of Personnel & Training mentioned the importance of training for Public Service Delivery because at the cutting edge it is the Group B & C employees who are functioning at a large scale and primarily responsible for image of the Government. The two-day Symposium has been organized by the Department of Personnel and Training in collaboration with UNDP India. The overarching objective of NSET is to provide an annual National Platform for experience sharing and interaction of various stakeholders associated with training of government sector employees. It was attended by more than 450 Delegates from all over India including faculty, trainers and administrators of National/State Training Institutes, Master/Recognized Trainers, Training Managers of various Ministries/Departments/Cadre Controlling Authorities. After the inaugural session, Shri Anand Singh and Ms Shaheen Mistree energized the delegates attending the Symposium with their inspiring talk. This was followed by plenary session on Designing a comprehensive Training Strategy which was moderated by Shri Sanjay Kothari followed by "Building Institutions of Excellence" moderated by Prof. Madhav Menon. The proceedings of the first day of the Symposium ended with an Open House session which was chaired by Cabinet Secretary Shri Ajit Seth. It included questions by the delegates and answers by the distinguished dignitaries. The symposium was well attended and generated a lot of interest among delegates who participated in the discussion in various sessions and also the open house. The Symposium showcased 12 best initiatives undertaken by individual trainers and Training Institutions under four thematic areas. These 12 initiatives will be felicitated with an Award of Excellence during the closing session tomorrow. The symposium was also watched by over 100 online viewers with 40 concurrent viewers through live webcast and many tweets were made and retweeted. eg. “This symposium is an opportunity to ask what makes great training great”– Shaheen Mistri from Teach for India, and “Imperative to make best use of youth power” by Dr. Jitender Singh, Minister of State for Personnel, Public Grievance and Pension. Minister of State (I/C) Petroleum & Natural Gas Shri Dharmendra Pradhan visited Mozambique on April 9-10, 2015. Besides meeting his counterpart the Minister of Mineral Resources & Energy, Mr. Pedro Couto, he also met Foreign Minister Mr Baloi and called on Prime Minister Mr Agostino Rosario. Three Indian PSUs (ONGC Videsh, Oil India Ltd & Bharat Petroleum) have already invested in a gas block, Rovuma Area 1 in offshore Mozambique. This is one of the largest investment of India in any single hydrocarbon asset abroad. During the meetings, the two sides discussed all issues related to the existing investment as well as ways to expand the relationship in other areas of oil and gas. It was agreed that there is scope for expanding cooperation in several areas of mutual interest. CMDs/senior representatives of ONGC Videsh, Oil India Ltd, Bharat Petroleum, GAIL, SAIL and senior officials of the Ministry of Petroleum & Natural Gas accompanied the Minister. A CII delegation of Indian businessmen with expertise in the oil and gas sector also accompanied the Minister. While laying down a road map for energy security of India on March 27 during his address at the Urja Sangam, Hon’ble Prime Minister had spoken about deepening our energy partnerships in Africa. Mozambique is an important partner in this context. Union Minister for Science & Technology and Earth Sciences Dr Harsh Vardhan, announced that the Indian pharmaceuticals sector would soon be showcasing ‘candidate drugs’ for malaria, osteoporosis and diabetes. He said with further R&D, important breakthroughs could be on the horizon for effective panacea for these conditions. Speaking after a visit to the Central Drug Research Institute (CDRI) a wing of the Council of Scientific and Industrial Research (CSIR), in Lucknow today, he remarked that Indian R&D efforts in government laboratories like CSIR-CDRI, CSIR-Indian Institute of Chemical Technology (CSIR-IICT, Hyderabad), CSIR-Indian Institute of Chemical Biology (CSIR-IICB, Kolkata), CSIR-Indian Institute of Integrative Medicine (CSIR-IIIM, Jammu), CSIR-Institute of Microbial Technology (CSIR-IMTECH, Chandigarh) and CSIR-National Chemical Laboratory (CSIR-NCL, Pune) have a track record in making drugs for Kala Azar, Filaria, Leprosy and Tuberculosis available at affordable rates to the common man. The “candidate drugs” are currently undergoing clinical trials. He further announced that simultaneously, CSIR-CDRI is carrying out Investigational New Drug (IND) studies on lead molecules for fracture-healing, cancers, thrombosis, malaria and hyperglycemia. The Minister said, “I am confident that the drug laboratories under CSIR are capable of backing up the Swasth Bharat Mission. Our scientists are focusing on both infectious and life-style diseases. We are developing next generation drugs, biologics, biosimilars, gene therapeutics, stem cell therapeutics, personalised medicine and multifunctional nanomedicine. Recently, CSIR-IMTECH, Chandigarh has developed a clot specific streptokinase. CSIR-IIIM, Jammu has discovered natural product-based potential medicine for rheumatoid arthritis. CSIR-IICB, Kolkata has developed an herbal extract for the treatment of benign prostate hyperplasia. “I am certain that India has the potential of becoming a global pharmaceutical powerhouse and is in the process of putting some key enablers in place. These include giving the right incentives for R&D, forging alliances with the private sector and keeping an open mind on suggestions for fiscal relief to the private sector so that its role in R&D is enhanced,” the Minister said. He said that in recent months he has visited a number of CSIR laboratories and is convinced that they have the competencies for new drug discovery and development including clinical trials, and has played a major role over the last six decades in the growth of pharmaceutical industry and education in India. Earlier, addressing scientists at the CSIR-CDRI auditorium here, he made it clear that the Prime Minister is committed to making India one of the world's leading destinations for end-to-end drug discovery and innovation by 2020. “Strengthening of the R&D ecosystem is the priority”, he added. He also emphasized that the people of India are expecting that CSIR laboratories would be able to produce therapeutic and preventive measures for re-emerged infectious diseases like Dengue, Chikunguniya, Encephalitis, Swine Flu as well as conditions like Cancer, Diabetes, Osteoporosis, Hypertension, Depression and Ulcers. The Minister thanked representatives of the pharmaceutical private sector who were present on the occasion for supporting CSIR labs in bringing the products from the laboratory to the market. Today, India ranks third in terms of volume of production with 10 percent share of the global market by volume and 14th largest by value. India is often dubbed the “Pharmacy of Developing World”. Dr Harsh Vardhan however pointed out that India still has a long way to go in Pharma R&D. Moreover, in India pharma needs to move from a phase of manufacturing to innovation. He expressed concern over the fact that currently, new drug R&D in India is mostly an affair of government organisations. “I request industry representatives to collaborate with CSIR laboratories in new drug R&D. The Prime Minister has given a call for Make in India. We need to generate millions of jobs in a couple of years because this country has a youth bulge. Seamless partnership will help develop products and technologies for the benefit of the common man,” he pointed out. In this context licensing of a new botanical product CDR4744F004 for osteoporosis and Centbucridine (Local anaesthetic), a new antithrombotic compound S007-867 and anti-stroke chemotype of Ashwagandha (NMITLI118RT+) are steps in right direction, the minister said. He announced that Government would soon set up the Biopharma Industry Incubator (BII) under the umbrella of CSIR-CDRI, Lucknow. It would strive to build a new generation of enterprises in the health care sector. The S&T Ministry is also considering setting up Government Laboratory Practices (GLP)-certified labs in CSIR-CDRI for complete range of Investigational New Drug (IND) studies. He said the step would foster new drug development as well as shore up the financial bottom line of the laboratory. Further, the Minister announced the formation of a National Centre for Laboratory Animals in the CSIR-CDRI new campus conforming to national and international guidelines. The new institution would serve as a referral centre for lab animal breeding and experimentation for new drug development. 1) The Prime Minister Shri Narendra Modi made appointments to the NITI Aayog, with Dr.Arvind Panagariya as the Vice Chairman, and Shri Bibek Debroy and Dr. V.K. Saraswat as Full-Time Members. The Vice Chairman and Members took charge of their offices here. Ms. Sindhushree Khullar was appointed as NITI Aayog's Chief Executive Officer. 2) The Prime Minister interacted with eminent economists on 6th February, 2015, for formulation of the Union Budget and discussion on the state of the economy, in his first visit to the NITI Aayog. 3) The Prime Minister chaired the first Governing Council Meeting of the NITI Aayog on 8th February, 2015 with Chief Ministers of States and Lt. Governors of Union Territories to work with the Centre to forge a model of cooperative federalism, whereby the Centre and States – TEAM INDIA – can come together to chart a common course for progress and prosperity. 4) A meeting for reviewing progress in Infrastructure sectors for 2014-15 was held under the chairmanship of the Prime Minister on 9th February, 2015. CEO, NITI Aayog made a presentation on the performance of infrastructure sectors in 2014-15 for the period of 10 months from April, 2014 to January, 2015. The sectors covered were related to Physical Connectivity (Airports, Ports and Inland Waterways, Railways and Highways), Digital Connectivity (Telecom) and Energy (Power, Coal, Renewables and Gas). In order to prevent cost and time overruns of important infrastructure projects, the Governing Council of NITI Aayog has requested States to create appropriate institutional mechanisms to address issues which cause delay in execution of the project. This is being further monitored by NITI. 5) Prime Minister constituted three Sub Groups of Chief Ministers on the following themes: Rationalisation of Centrally Sponsored Schemes, Skill Development, and Swachh Bharat. 6) The Union Budget 2015 announced the setting up of Atal Innovation Mission (AIM), Self-Employment and Talent Utilization (SETU) and Unified National Agriculture Market under the NITI Aayog. The Union Budget also has a provision for providing special assistance by specific intervention through NITI. 7) The first meeting of Sub Group on rationalisation of Centrally Sponsored Schemes, convened by the Chief Minister of Madhya Pradesh, was held in the NITI Aayog on 27th March, 2015. 8) In pursuance of the decision taken in the Governing Council Meeting, two Task Forces have been formed in order to tackle the crucial subjects of Agriculture Development and Elimination of Poverty under the leadership of Dr. Arvind Panagariya. The initial meetings for both Task Forces have been held. In addition, every state will constitute Task Forces on these subjects. 9) NITI Aayog has initiated the process of undertaking the mid–term appraisal of the Twelfth Plan. This opportunity is also being used to weave in the national development agenda discussed in the meeting of the Governing Council for its suitable implementation in the remaining two years of the Twelfth Plan. 10) As NITI’s first initiative, the report “India’s Renewable Electricity Roadmap 2030—Toward Accelerated Renewable Electricity Deployment” was released at the Renewable Energy Global Investors Meet & Expo (RE-INVEST 2015) on 15th February, 2015. 11) Pioneering the change in Government Buildings, NITI Aayog was awarded a five star rating by the Bureau of Energy Efficiency (BEE). NITI Aayog has retrofitted its electrical appliances to achieve the highest energy efficiency rating for commercial buildings. 12) The erstwhile Planning Commission won the Web Ratna Gold Award under the Open Data Champion category. NITI will continue promoting initiatives like Open Government Data Platform India. 14) A delegation of the National Planning Commission of Nepal, Dr. Ziad Bahaa-Eldin, former Dy. Prime Minister of the Republic of Egypt and Mr. Anthony Foxx, the Secretary of Transportation for the United States of America, are among the distinguished guests who have visited the NITI Aayog in the last 100 days. 15) A pilot was successfully completed for universal enrollment of children aged 0-6 years by concurrent Birth Registration and Aadhar Enrollment in Haryana between 23rd February and 6th March, 2015. NITI Aayog participated in this exercise along with other ministries and departments. 16) Every week, employees of NITI Aayog devote time by performing Shram Daan and Samay Daan towards the Swachh Bharat Mission and maintain cleanliness around the premises of the institution.